February 17, 2015 – Fiske Planetarium’s production studio, under leadership from Producer Thor Metzinger, has completed a half-hour fulldome show about the Cosmic Origins Spectrograph (COS) instrument installed on the Hubble Space Telescope. The new show titled, “Cosmic Origins Spectrograph,” will be added to the planetarium’s show schedule beginning in March. 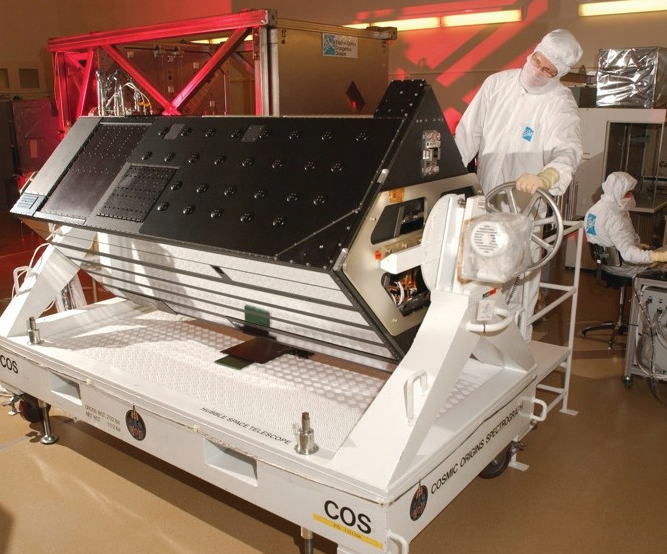 The Cosmic Origins Spectrograph was the final instrument added to Hubble, and was designed and built in Boulder by the University of Colorado’s Dr. Jim Green and team (with help from colleagues at the University of California at Berkeley). Fabrication, integration & testing was performed by Boulder’s Ball Aerospace. It was installed on the Hubble Space Telescope during Servicing Mission 4 (STS-125) in May 2009. COS is designed to study the large-scale structure of the universe and how galaxies, stars and planets formed and evolved. It has helped scientists determine how elements needed for life such as carbon and iron first formed and how their abundances have increased over the lifetime of the universe. As a spectrograph, COS breaks up light into its individual components. Any object that absorbs or emits light can be studied with a spectrograph to determine its temperature, density, chemical composition and velocity. A primary science objective for COS is to measure the structure and composition of the ordinary matter that is concentrated in what scientists call the ‘cosmic web’ — long, narrow filaments of galaxies and intergalactic gas separated by huge voids. The cosmic web is shaped by the gravity of the mysterious, underlying cold dark matter, while ordinary matter serves as a luminous tracery of the filaments. Visit http://fiske.colorado.edu/beta/ for a full schedule of events and more information about Fiske Planetarium.